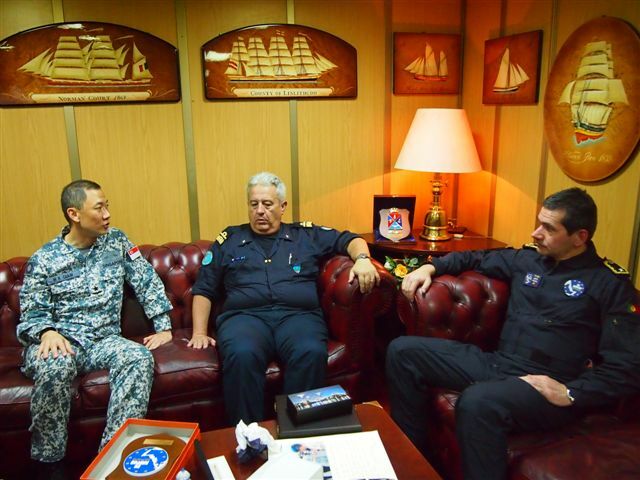 A delegation from the Combined Maritime Forces’ (CMF) Combined Task Force 151 (CTF 151) has met with other task forces from the EU and NATO to discuss counter-piracy efforts in the Gulf of Aden. CTF 151’s Singaporean Commander, Rear Admiral Giam Hock Koon met with Portuguese Commodore Jorge Palma, head of the EU’s Task Force 465, and the Commander of NATO’s Task Force 508, Italy’s Rear Admiral Antonio Natale, aboard ITS San Marco to strengthen cooperation and collaboration between the three international task forces. All three task forces play a vital role in providing maritime security in the Gulf of Aden, and work closely together to counter the threat of piracy in the region. Counter-piracy forces cooperate extensively with other nations and organizations within the region that are engaged in counter-piracy activity. By joining forces, counter-piracy efforts are more effective than any one ship, navy, organization or nation working alone. Commodore Palma, who recently took over as the new Commander of Operation Atalanta, the EU’s anti-piracy mission in the region, emphasized that all three task forces must continue the unity of effort, concept of operations and investment in sharing awareness. Rear Admiral Natale assumed command of Standing NATO Maritime Group 2 (SNMG2) assigned to NATO’s counter-piracy mission, Operation Ocean Shield, in November 2012. He agreed that cooperation among the task forces leads to enhanced success in the area of operations. While aboard San Marco, the delegation toured the ship, visiting the bridge and Command Information Centre, met with the Explosive Ordnance Disposal team, helicopter pilots and boarding teams and shared lunch.